UIC United Faculty stands in full solidarity with the UIC Graduate Employees Organization, Local #6297, in its fight to win a fair and just contract, and its members’ decision to withhold their labor to get this result. Graduate workers at UIC deserve a living wage that is suited to a Research I university. You deserve fee waivers and protections to assure your hard earned wages are not reduced, which in some cases is to nearly nothing. And you deserve reasonable notification of appointments and reappointments. In short, you deserve RESPECT! We understand that a strike is not an action you want to take. However, based on the last decade of the administration’s consistent behavior at the bargaining table, which is continuing even now on the eve of your strike, it is clear why striking is necessary to get the contract the GEO deserves in order to improve conditions now and in the future for all graduate student workers. We are watching closely to see how the administration and UI leadership respond as we move into mediation on our own contracts. It is our hope that the Board of Trustees and President will lead in changing the anti-union culture in the UI system, so that future contracts can be worked on collaboratively–with labor, instead of against it. We are unequivocally urging all faculty to honor GEO picket lines, and offer support in any way we can to help you win a fair contract, no matter how long it takes. Grad workers are on strike starting today, and will continue withholding their labor until they win a fair contract. Their full press release is reproduced below. We encourage all faculty and community members to show support in any way they can! Over 1500 Teaching Assistants and Graduate Assistants at the University of Illinois at Chicago will withhold their labor indefinitely starting tomorrow, March 19, after stalled contract negotiations between the UIC Graduate Employees Organization (GEO) and the university administration. A majority of GEO members voted in mid-February to authorize a strike, with 99.5% of voters approving. Contract negotiations began over a year ago, on March 1, 2018. TAs and GAs have been working without a contract since September 30. GEO is seeking living wages and fee waivers. The university administration has consistently rejected these proposals. We will be striking over all of these issues, as well as an Unfair Labor Practice. Despite being highly educated professionals providing skilled labor for a multibillion-dollar institution, UIC grad workers live on the edge of poverty. They make as little as $18,000, even when serving as the primary instructor for courses with as many as 60 undergraduates, and are simultaneously required to pay up to $2,000 in annual university fees. Grad workers’ low pay, high fees, and often precarious employment negatively impacts their academic progress, professional development, and overall health, which only undermines UIC’s educational and research mission. UIC is offering grad workers raises well below what GEO has won in the past, while rejecting calls for fee waivers and transparent appointment policies. At the same time, UIC is flourishing. Enrollments are at record highs, multimillion-dollar construction projects are underway, the campus recently acquired a law school, the university president recently got a $100,000 bonus for the third year in a row, and UIC has announced a $1 billion investment in infrastructure renovations. Nearly half of the employees represented by GEO are international graduate student workers, whose visa status doesn’t allow off-campus jobs and limits access to loans and credit cards. 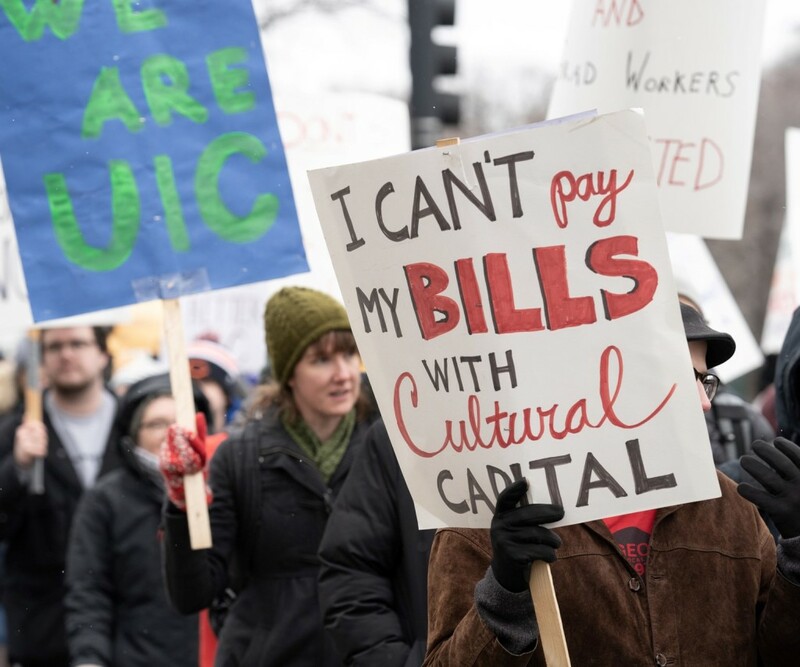 Despite their extra financial hardships, in recent years UIC has begun charging international grad workers additional fees that domestic grads don’t have to pay. This is the second year in a row that grad workers at a U of I campus are forced to go on strike for a fair contract. Last February, grad workers at the Urbana-Champaign campus were on strike for nearly two weeks before an agreement was reached. Meanwhile, UIC’s 1200 tenure/tenure-track and non-tenure-track faculty—represented by United Faculty—are also in the middle of contentious contract negotiations and have been working without a contract since last fall. The UIC Graduate Employees Organization, Local 6297 of the Illinois Federation of Teachers-American Federation of Teachers, is the member-run union that represents more than 1500 Teaching Assistants and Graduate Assistants at UIC. GEO was officially recognized in 2004 and won its first three-year contract in 2006. GEO ratified its fourth three-year agreement in 2015 that expired in September 2018. The following is a supplement to our initial guidance to faculty on how to conduct yourselves during a grad worker strike. This was formulated to answer ongoing questions from faculty, and to respond to an evolving situation with regard to the strike and Administration’s reaction to it. Please email UICUnitedFaculty@gmail.com if you have questions beyond what is covered here! How can I continue to support the GEO while they are on strike? Refreshing your knowledge about what is legally not allowed during a strike here. Joining strikers on the picket line when you are not teaching or holding office hours. Delivering your classes without crossing the picket line – if and when possible (see below for strategies some faculty have employed). Showing solidarity if and when you need to cross a picket line to teach, hold office hours or attend a mandatory meeting (e.g., download and print the FACULTY SUPPORT GEO sign attached and carry it with you). Continue sending messages to the administration about how much we need our grad student employees – how we cannot function without them and how they deserve a fair contract just like we do. Send to Chancellor@uic.edu, Provost@uic.edu, presidentkilleen@uillinois.edu and Board of Trustees (uibot@uillinois.edu). From our perspective, this work stoppage is management’s problem to solve. Only they can bargain a fair contract, and until that is reached, the “problem” will continue. UIC simply cannot function without grad workers’ labor, and they deserve a contract that reflects this reality. What are some alternative methods for delivering classes and keeping office hours? Teaching on-line including posting your lecture on Blackboard (or some other source) during the time the class meets and asking for students to comment/ask questions during a fixed period of time. This requires clear communication of what is expected and how it aligns with if not mirrors what was to be covered in person. Providing answers to quizzes on-line after students have completed them – so not grading but letting students be able to check what they missed/got correct – and giving them credit for taking it. Holding student conferences at Student Center East or West or at other off-campus locations (lots of coffee shops are brimming with UIC students and faculty). If you have other alternatives or good off campus locations to share, please send to uicunitedfaculty@gmail.com. How can we handle grading assignments once the strike is over? I have heard from several people wanting to know what happens after the strike ends. At this point, our understanding is that the GEO will bargain to be paid for any work that a TA makes up. We will also, through our demand to bargain address this issue. Because this is not yet determined, we cannot say what will happen. What can say is that we all have to remember that whether on strike or after, we do not want or expect faculty to do the work of a striking worker and we do not want a grad worker to do work without compensation. How do I respond to a request from my superior (head, chair, director, EO) as to how I will help make sure that our undergraduates are being served during the strike? As we understand it, a request from the provost was sent to deans and, in LAS at least, faculty are being asked to help plan how TA-led courses and TA-assisted courses will be taught in the absence of the TA. Further, the administration wants information about these plans by Saturday (3/30). It is our opinion that such a request is subject to demand to bargain by the Union, and we have accordingly amended our original demand issued to the UI Labor Relations 3/19/19. Our reasoning is that the mere act of asking what needs to be done assumes faculty know what is not getting done and implicitly by whom, which puts faculty in a situation that would violate labor law in order to provide an answer. Also, it represents a change in our working conditions. Both are subjects of bargaining as requested by UICUF on 3/29/19. Such a request is also likely an Unfair Labor Practice since, instead of bargaining with the faculty union as requested in its demand, management has chosen to effectively bargain with individual members on changes in their working conditions. Further, anything that would require a faculty member to do the work of a striking GEO worker – even if the faculty member is the instructor of record – potentially represents an Unfair Labor Practice in our opinion. Any requests for me to do the labor of a striking worker cannot be fulfilled as this is currently the subject to demand to bargain by UIC United Faculty, and also may be an Unfair Labor Practice. You may want to add: It is my understanding that it is the responsibility of University administration to respond to and resolve the strike, not the faculty. What if I feel pressured or even threatened to respond to such a request or any other similar request, or if I am uncertain how to respond? To date, we have not heard from any faculty member that they have personally felt pressured but rather that the emails coming down are not easily answered even with our guidance. This last “mandate” is particularly difficult considering the time frame for completing it on top of the issues sited above. At this point, I want to remind all union members that you have Weingarten Rights, which guarantee an employee the right to Union representation during an investigatory interview. An investigatory interview is one in which a Supervisor questions an employee to obtain information which could be used as a basis for discipline or asks an employee to defend his/her conduct. We consider the above circumstances ones under which Weingarten Rights could be claimed. To claim your Weingarten Rights during an in-person meeting, stop the conversation and say that you do not want to go any further until you have a representative from the union present. Then seek your representative, our chief steward or Jeff Edwards (UICUFJeff@gmail.com). If this occurs over email, please contact your representative, our chief steward or Jeff before responding. How should I discuss the strike with my GA’s/TA’s? While some contact on the subject of the strike may be unavoidable, we strongly recommend that faculty not discuss the strike with their TA’s/Ga’s. It is unlawful to encourage or discourage participation in union activities (including membership, striking and other actions), and likewise is unlawful to inquire about individual grad workers’ intentions to participate. Finally, it’s unlawful to surveil or record the names of grad workers participating in union activities. Given these realities, it is best to avoid even the appearance of interference, by simply not engaging in discussions of the strike with grad workers where possible. Grad workers who seek your input or ask specific questions about the strike should be directed to contact UIC GEO and/or their department administrators. When is it okay to cross a picket line? While it is permissible to enter a facility when pickets are not active UICUF urges faculty to honor active grad worker pickets unless absolutely unavoidable. This includes crossing lines to access your own office or lab. You should follow your own department/college guidelines to relocate or reschedule classes, exams, etc. to times or locations not being picketed, including online. This may require some advanced planning, and/or coordination with your department office. If crossing a picket line is unavoidable, faculty should practice solidarity as best they can, by positively engaging with/marching with picketers before entering a picketed building, and informing them why you have to cross their line. Can I be asked to report on grad worker strike participation? Recording or reporting strike participation is a clear violation of grad workers’ rights to participate in a labor action free from coercion or intimidation. Such actions will likely be viewed as unfair labor practices by UIC GEO, and therefore are likely to be litigated accordingly. We have also submitted a demand to bargain over the change in working conditions. UICUF does not view a directive to record or report on strike participation as legally enforceable at this time. If you are asked to record or report on strike participation, inform UICUF immediately. Can an Administrator ask if I Rescheduled/Relocated/Cancelled Class Because of the Strike? No, faculty are not obligated to report why you altered your class schedule. The Illinois Educational Labor Relations Act prohibits an employer from interfering, restraining or coercing employees in their exercise of rights under the act 115 ILCS 5/14(a)(1). Asking whether an employee cancelled their class in solidarity with another strike (as opposed to because of illness, weather, poor attendance, or any other reason) is an unfair labor practice. Whatever procedure was already in place for reporting class cancellation has to stand, they cannot create a new procedure for reporting class cancellation because of the strike. Can grad workers cover classes if there is no active picket at that time/location? Grad workers can choose to participate in the strike, or not, at their sole discretion, regardless of picket times/locations. The work stoppage, however, is not limited to when pickets are active. Faculty should not, therefore, ask grad workers to work around the picket, or ask whether grad workers intend to withhold their labor at any time while the strike is in effect. Do I have to cover my grad workers’ classes, grading, etc. until the strike ends? Faculty should not voluntarily cover work that would otherwise be assigned to TA’s/GA’s, so long as it does not violate department/college policies. Should department/college policy require you to cover certain work, or if you are directly ordered to do so by an administrator, we recommend that you comply within the limit of the requirement, and report it to UICUF immediately. This will help us offer guidance to colleagues in similar situations, or begin the process of pushing back if such direction is inappropriate. From our grad worker colleagues and fellow union members with UIC GEO, further guidance on how you can support them as they prepare to strike for a fair contract. UIC GRAD WORKERS DEMAND A FAIR CONTRACT NOW! The Graduate Employees Organization (GEO) is the union representing over 1500 Teaching Assistants and Graduate Assistants at UIC. We have been negotiating a new labor contract with the University administration since March 1, 2018, and we have now announced our intent to strike on March 19. The administration has until then to respond with a fair contract with living wages, more take-home pay, and clear hiring policies. ● Living wages: Grad workers at UIC are among the lowest paid grad workers in Chicago, making $10,000 less than our colleagues at other Research 1 universities in the city. ● Fee waivers: UIC grad workers have to pay nearly $2,000 in fees every year. That’s over 10% of our income, amounting to wage theft. We shouldn’t have to pay to work here! ● Appointment/reappointment policies: Grad workers often have no idea how hiring/rehiring decisions are made, leading to favoritism, discrimination, and retaliation in our departments. Of these the demands, the university has outright refused to give us any proposal on fee waivers and re-appointment policies, and has offered us a “raise” that does not keep up with the cost of inflation, which would actually be a pay decrease in real dollars. We deserve better. ● Join us on the picket lines: Unless the administration decides to give us a fair contract before we intend to strike, we will be out on the picket lines starting Tuesday, March 19, and every day afterwards, until we get the fair contract we deserve. We will be on the picket lines from 8:50am-4:00pm on M/W/F, and 9:20am-4:00pm on T/TH. If you can, please join us on the picket lines in solidarity with us! ● Come to our rally: We are planning to hold a big rally on East Campus on March 20 around noon. Please come to support during this rally if you can. Chicago, IL – After sacrificing for years, members of the University of Illinois – Chicago United Faculty (UICUF) are seeking salary improvements, protection of existing benefits, and a commitment from the University to hire new tenure-track faculty to serve UIC’s growing student population. On Thursday, March 14, 2019, UIC United Faculty will rally and picket at UIC’s University Hall, coinciding with a meeting of the U of I Board of Trustees in Urbana. The faculty union will draw attention to the extended and increasingly difficult negotiations with the administration for a fair contract. UIC faculty have been working without a contract since August, 2018. As in the past, the administration seems intent on forcing a strike before they will bargain productively. Graduate employees at UIC are currently on the brink of a strike, and faculty may soon be forced to take a strike vote if the administration continues its refusal to compromise. Follow the UICUF on Facebook for updates. UIC United Faculty (Local 6456) is an affiliate of the Illinois Federation of Teachers (IFT).The IFT is made up of more than 100,000 teachers and paraprofessionals in PreK-12 school districts throughout Illinois, faculty and staff at community colleges and universities, public employees under every statewide elected constitutional officer, and retirees. Who are We Bargaining With, Really? If you follow our posts, you probably have a good idea of what contract negotiations look like. Faculty and Administration negotiators meet, bringing forward proposals and counter-proposals, trying to shape the next faculty contract. But where does the power on the other side lie, really? Our bargaining team is empowered to negotiate a contract based on member input, which is then voted on by the members. On the Admin side, the Board of Trustees votes to ratify any agreement Admin brings back from the table. The Board may also guide negotiating priorities. In the current round of negotiations, Administration has so far danced around non-economic issues, and has insultingly low-balled faculty on money issues. Grad workers, who are negotiating their own contract, have received similar treatment and are on the verge of a strike. It’s especially frustrating to haggle over relatively small amounts at the table, when a $1 Billion dollar plan for new facilities is being promoted simultaneously. New buildings are important to a growing university, but they don’t educate students, or do research. People do that. As Admin and the Board plan vast expenditures on new construction and deferred maintenance, they must make parallel investments in human capital. New tenure-track positions will be needed, and the deferred maintenance of faculty salaries has to be addressed as well. The Board sets the tone for these priorities, and we hope they’ll consider a more holistic approach to growth. The Board of Trustees has a powerful say in Admin’s bargaining disposition. They will be meeting tomorrow, and we have a message for them: “Don’t make us strike just to get a fair contract!” It’s high time the Board took its human capital more seriously, and we will rally and picket to remind them of that: Thursday, 3/14, 11:30-1pm @University Hall. 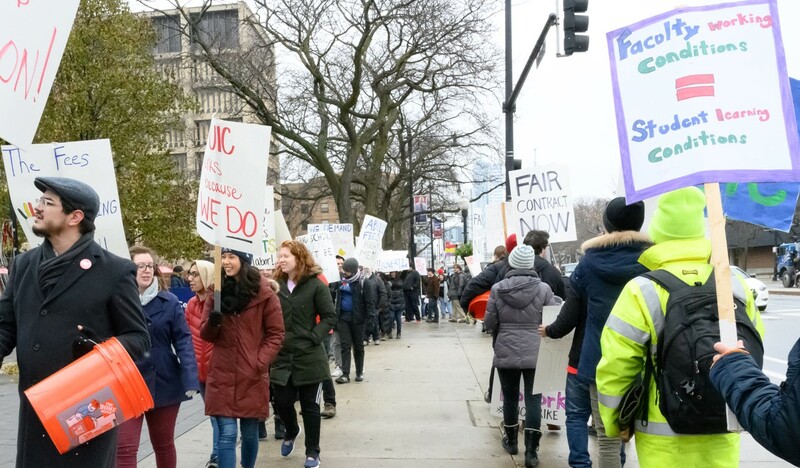 The UIC Graduate Employees Organization (GEO), which represents Teaching Assistants and Graduate Assistants, intends to begin their indefinite strike on Tuesday March 19th, 2019 (assuming contract negotiations continue to be stalled). This guide describes how faculty can support GEO, as well as the legal rights of striking workers which must be respected. Move classes to either evening hours, to an off campus location, or to non-struck buildings, if possible and allowed under your unit’s policy. Join GEO members on picket lines when not working. Donate to GEO’s strike fund and share this link among your personal social networks. Wear GEO pins, shirts and other items that demonstrate solidarity in your workplace. Talk to students about why GEO is striking, including fair wages, fee waivers, and appointment transparency. It is unlawful to fire, discipline, or retaliate against grad workers for participating in a strike or union activity. It is unlawful to ask grad workers to inform anyone in advance of participating in a strike or union activity. It is unlawful to record or threaten to record the names of grad workers participating in a strike or union activity. It is unlawful to discriminate against, restrain, or coerce grad workers regarding union membership or activity. As fellow union members, we thank you in advance for respecting the rights of organized graduate employees during any upcoming labor actions, and encourage you to lend your support outside the classroom as you are able. If you have any questions, please email UICUnitedFaculty@gmail.com. At our last negotiating session, the Administration team agreed to join us in seeking mediation, acknowledging the deep divide that remains between the two sides. Meanwhile, grad workers, who’ve bargained for a year without meaningful progress on their most important issues, have resoundingly authorized an indefinite strike. Provoking mediation and strikes is not a negotiating record to be proud of, yet this seems to be the UI System’s standard operating procedure. Just last year, grad workers at UIUC were forced to go on strike to protect tuition waivers, and win fair raises. Before that, faculty at UIS, UIUC, and here at UIC, all had to strike to get their first contracts. While not surprising, it is disappointing that UI’s labor relations strategy has once again brought one union to the brink of a work stoppage, while our own union is forced to consider a similar route. With that clear pattern of behavior looming over our negotiations, UICUF is making a strong appeal to the UI Board of Trustees, and our Administration, to change the narrative. New board members will be taking their seats on the UI Board of Trustees next Thursday, and letters from the union are already in the mail welcoming them, but also laying out clear expectations that they must do better for unionized workers at all our campuses. It is high time to turn the page on the toxic stance the UI System has taken towards its employees. UIC’s budget presentation overlooks investment in faculty. Administration admits to not planning for the economic future of UIC faculty. Both sides agree to move forward with third-party mediation. On Friday we had our 18th negotiation session with the Administration team. 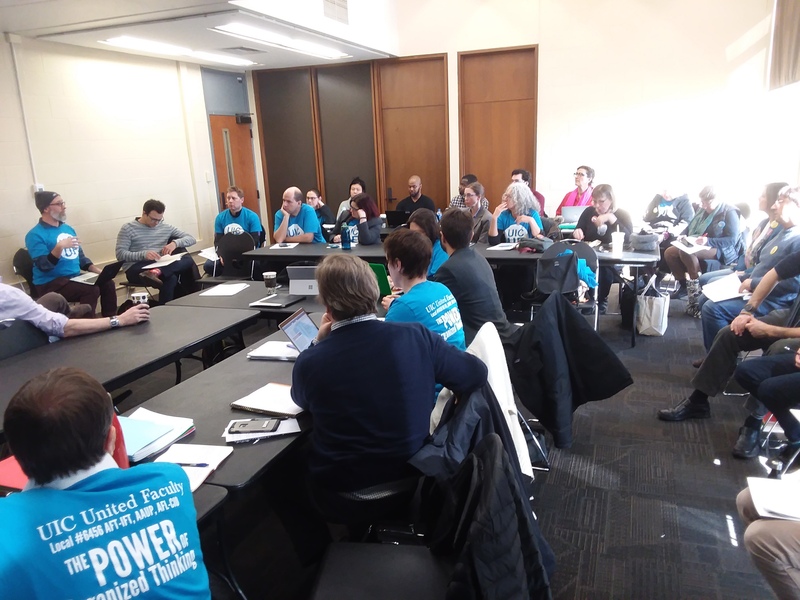 Over 40 UIC faculty from across campus attended as observers and caucused with the bargaining team. The experience was as eye-opening as promised, although no counter-proposals were offered by the Administration team, and no TA’s were reached. The session opened with a budget presentation describing UIC’s funding lines and budget priorities, which included a plan for deferred maintenance, but not for deferred investment in faculty. For many of the faculty present, the presentation raised as many questions as it gave answers: How much does the education of a UIC student really cost? Why aren’t they fighting for the BOT and state to fund the education of UIC students? If the paradigm never shifts, is the admin ready to accept the same financial conditions faculty have accepted for the past decade? We were told in negotiations that university administration is committed in principle to improving faculty working conditions that ensure continued student and faculty excellence, but at this moment in time, administration will not commit to action. They will not commit to every member of the UIC faculty having office space. They will not commit to ensuring every faculty member enjoys academic freedom through clear and transparent processes in which faculty voices play an important role. They will not commit to long-deferred raises that will finally bring salaries in line with rising inflation costs that have essentially created pay cuts for many faculty during past austerity. It is our position that in this time of growing enrollments, increased economic prosperity, and a growing national and international reputation, more gains for faculty must be won to continue the institution’s momentum and progress. We will not accept a contract that does otherwise. On Friday, the administrative team agreed to third-party mediation, which is an important step toward the contract we all deserve. 21 Feb Are Faculty Naive? 120 faculty met yesterday to discuss bargaining, UIC finances, and our values. Faculty proposals further UIC’s education mission at a tiny fraction of revenue surplus. ORGANIZER TRAININGS: Open to all interested members, Mon, 2/25, 3-5pm and Tues, 2/26, 12-2pm @UICUF offices 1016W. Jackson Blvd. 120 union members met yesterday to discuss contract bargaining, university finances, and our shared values. For many attending, the budget figures we looked at were revelatory, as was the reality of Administration’s resistance to faculty proposals. Admin negotiators have repeatedly asserted that faculty are acting naively at the bargaining table, that the finances are set and nothing can be changed. 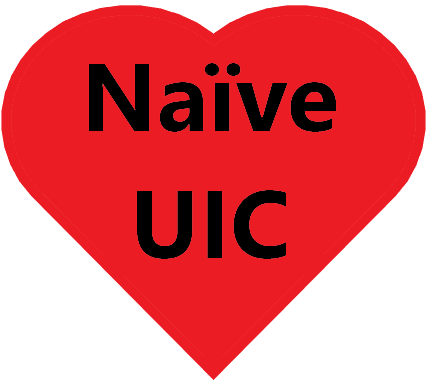 But if naivete means believing a better university is possible, or challenging Admin’s narrow view of what’s possible in a labor contract, the energy in the room yesterday suggests we have a whole lot of naive faculty at UIC. Naive to Think Education is a Priority? Our economic proposals represent less than 2% of the university’s revenue surplus this year–yet we are naive to think that education, and those who work to provide it, should be a priority in a university’s budget. Administration warns (read: threatens) tuition hikes and lay-offs if salaries rise, even though the latest financial reports describe a very healthy balance sheet for UIC. Additionally, Gov. Pritzker just proposed a 5% increase in higher education funding, and states have been reversing spending cuts for over a year now (the trend is still going strong). Admin would have us believe they need maximum flexibility in case we regress into abject austerity, recent news notwithstanding. How naive do they think we are? So when Administration points to our proposals for fair salaries, for hiring faculty to keep up with enrollment, for protecting shared governance and academic freedom, and calls us naive, maybe they’re right. We believe UIC can do better. We believe education should be a funding priority. We believe faculty deserve more from a labor contract. That’s the kind of naivete worth fighting for. The best way to know the truth of something is to experience it first hand. Come to our bargaining session tomorrow, Friday, 2/22/19, 1-4pm @Student Center East Tower, Room 603. Over 100 members have come to observe and caucus with the team to date, and we encourage you to join us in this eye-opening experience. If you cannot attend bargaining, consider training with the UICUF organizing team around contract action issues. 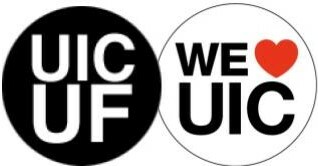 Trainings will be held Monday, 2/25, from 3-5pm and Tuesday, 2/26, from 12-2pm at the UICUF offices (1016W. Jackson Blvd). RSVP to UICUFJeff@gmail.com if you are able to attend either event.